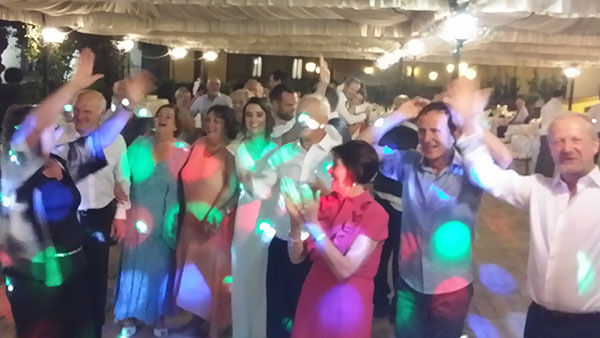 Frascati near Rome: Neil Diamond’s hit “Sweet Caroline” performed by Guty & Simone – the Italian wedding Musicians – recorded during an Irish wedding reception party at Villa Tuscolana, Via del Tuscolo km 1.500, Frascati, Roma, Italy. Guty & Simone usually send to their clients their full songlist and prepare a personalized repertory for them following all the bride&groom requests and suggestions. As they did in this case (the bride requested it!!) they can also prepare an extra song to which the bride and groom are personally tied, for example the first dance song. The day Carol and Colm got married in Frascati it seemed to be a bit rainy, but as soon as they arrived to Villa Tuscolana for aperitifs, dinner, and after dinner party, the weather gradually improved and everybody spent a beautiful Italian summer evening. The Irish spouses and their guests really enjoyed the party and danced the whole time to the live music and Dj sets played by Guty & Simone. Villa Tuscolana, Sweet Caroline, live in Rome.